Become Darth Vader. 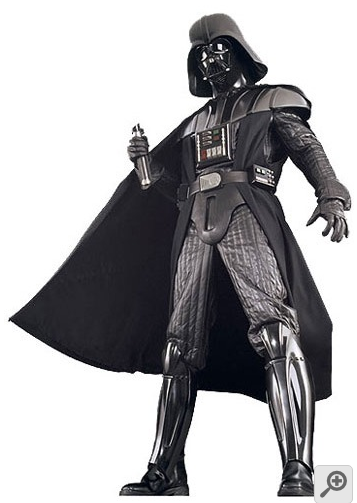 Here is one of the best Star Wars Cosplay Darth Vader costume I could find. Darth vader is one of the most important characters in Star Wars. There are plenty of Darth Vader costumes out there, but none are as authentic as this one. This is an officially licensed costume and perfect to use when dressing up to go to a Comic Con Convention or Fan Expo. 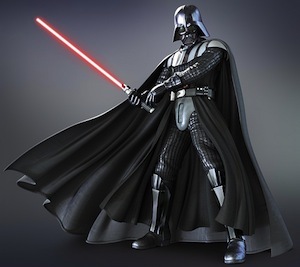 Here’s the scoop on this authentic Darth Vader costume. You can check out other Star Wars costumes here. The cosplay costume includes a fabric head cover, two-piece molded helmet and a voice module. The voice module makes a breathing sound that sounds just like Darth Vader. There is a full color display box for the mask and helmet. All electronic components require 8 AA batteries which are not included, but can be purchased here. 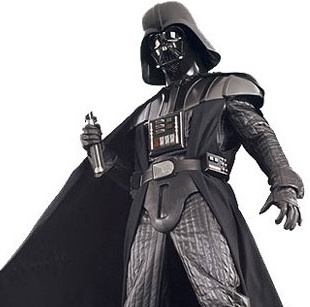 Darth Vader’s costume comes with a full body quilted faux leather body suit with grooved detailing. The armor that comes with the costume are all injection mold armor pieces made from ABS material cast from original Lucas Studio molds. This includes the molds for the shoulder guards, mold chest armor with red and green LED lights, mold codpiece, mold shin guards and the two piece mask and helmet. 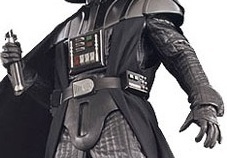 There is a zipper fly in the crotch. The quilted faux leather gloves are fitted to your hands. Also included is the leather belt with LED light up box. 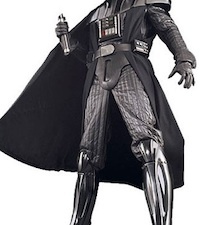 This Darth Vader costume also includes cape. As you can see in the picture, there is a black inner robe and the flowing black cape. Both are included. The black inner robe and inner cape fits snugly around the shoulders and the flowing black outer cape can billow in the wind when you stand in front of a fan. Very cool looking. The shiny shin guards that you see in the picture are also included. This is as mentioned above are injection mold armor pieces made from ABS material cast from original Lucas Studio molds. One thing the costume does not include is a light saber. You must have a light saber if you are Darth Vader. 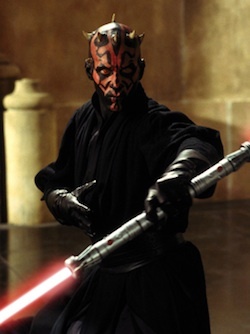 Darth Vader’s light saber is red. Don’t forget to purchase one! 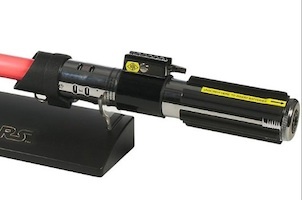 This lightsaber is the official replica of Darth Vader’s lightsaber from the Star Wars: The Empire Strikes Back. It glows bright red and ignites with realistic power-up and power-down light effects. 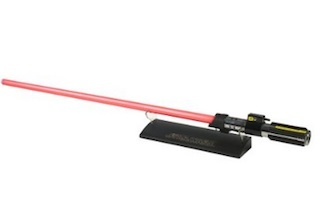 The main feature of this lightsaber is that has four motion sensor control sound effects changing when it’s powered up, idle, clashing with another sword and powering down. The metal hilt looks and feels like a real lightsaber. See the picture on the right. It has a sturdy and permanently attached blade. That will complete your Cosplay Star Wars Darth Vader costume. Have fun!